What are the fire regulations for commercial buildings? Within a commercial property, certain fire safety regulations must be adhered to in order to ensure the property is safe for those working in it, plus any customers or clients if applicable. There are currently nearly 20,000 commercial fires in the UK each year, so fire safety is of the utmost importance. All commercial fire safety legislation in England and Wales falls under The Regulatory Reform (Fire Safety) Order 2005, which was designed specifically to simplify the existing legal requirements at that time. With some minor exceptions, any commercial premises – property that is used for a non-domestic purpose – is bound by these regulations. Anyone else who may have control of the building, such as a facilities manager, risk assessor or commercial property management company. Who is defined in commercial fire regulations as a ‘Responsible Person’? The individual who is responsible for these fire regulations being carried out is known as a ‘Responsible Person’. Every business must have at least one designated ‘Responsible Person’ and it is their responsibility to ensure that certain duties are carried out, action is taken to prevent fires and prevent injury or death if a fire does occur. What do commercial fire regulations say about Fire Risk Assessments? All businesses and commercial properties must have a regular fire risk assessment, which is the responsibility of the Responsible Person. This is one of the first things an inspecting officer from the fire authority would request to see if they inspected a commercial premises, alongside the fire safety log book. Many commercial businesses choose to use a specialist fire risk assessor to carry out their risk assessment, but this is not obligatory. If a commercial business does not adhere to the required fire safety regulations, they face a fine, prosecution or in cases of extreme negligence, a prison term. What do commercial fire regulations say about fire extinguishers? Fire safety regulations specify that commercial premises must be equipped with appropriate fire fighting equipment. This includes fire extinguishers as standard and, depending on the nature of the business, may also include sprinklers and hose reels. What do commercial fire regulations say about fire safety signs? What do commercial fire regulations say about fire alarms? By law, all commercial premises must have an appropriate fire detection system in place. The system must be tested weekly and should be serviced at least every six months. If your business is more at risk of a fire, such as a restaurant, an automatic system is recommended. Manual systems should suffice for lower risk business premises. For all businesses, everyone in the building must be able to hear the alarm clearly and there must be a call point on every floor. 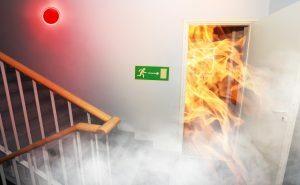 What do commercial fire regulations say about emergency lighting? Emergency lighting is designed to provide light if the normal lighting in a building fails in a fire. Your emergency lights should be ‘flick-tested’ – turned on and off – monthly and serviced fully annually. For further advice and assistance in all matters of commercial property management, plus commercial property sales and purchases at auction, get in touch and our expert team will be happy to help you.